We can use it embedded with HTML code for more efficient, error free webpage. 1 onAbort It occurs when the user stops the loading of an image. 2 onBlur It occurs when an object on the page is no longer the 'focus'. 3 onChange It occurs when a text field is changed by the user. 4 onClick It occurs when the user clicks an object. 5 onError It occurs when a document or image can't load correctly. 6 onFocus It occurs when an object takes the 'focus'. 7 onLoad It occurs when a page is loaded. 8 onMouseOver It occurs when the mouse cursor moves over an object. 9 onMouseOut It occurs when the mouse cursor moves off an object. 10 onSelect It occurs when the user selects text in a text area. 11 onSubmit It occurs when the user clicks the "submit" button on a form. 12 onUnload It occurs when the user leaves a document. Now we will discuss the above functions with suitable examples. onDblClick is also the same process like onClick event. Using this event we can easily measure the status through the following code: In the following code we can access the data by just double clicking on the button. This is also very nice event. This action is already done when we wrote the script for the "twirling hand". Associated events are onMouseOut and onMouseDown. They are generally used for links and images. Generally it is used when onMouseOver is used to swap images around for creating a rollover effect. Basically this event precedes a place when objects lose focus (change the cursor position). If we click inside the text box then click outside it and the textbox has lost focus. That movement onBlur event will be fired. The following code easily demonstrates the working principal of the onblur event. This is a very useful event that can be used for data validation on a form. Sending data from one page to another page it is takes a vital role. We can use this event with a Submit button. The details on the form can be checked for errors. We catch any error and we can stop the form's details from being submitted. Note the use of the word return statement. This is set to a Boolean value. If we return it false, which means wrong arguments then the form cannot be submitted. On the other hand if it is true then the form is submitted successfully. This form is not very secure because it is only Submit button. But if we set this submit button through the following manner then it checks data step by step. In this function we can set a variable (flag) to false. This is just used for testing purpose and that means the user has filled up the form incorrectly. We look at the two return values though. If the Details are false then return is set to false message from the user and the form doesn’t get submitted. Other hand when the details are true then return is true and the form is submitted successfully. 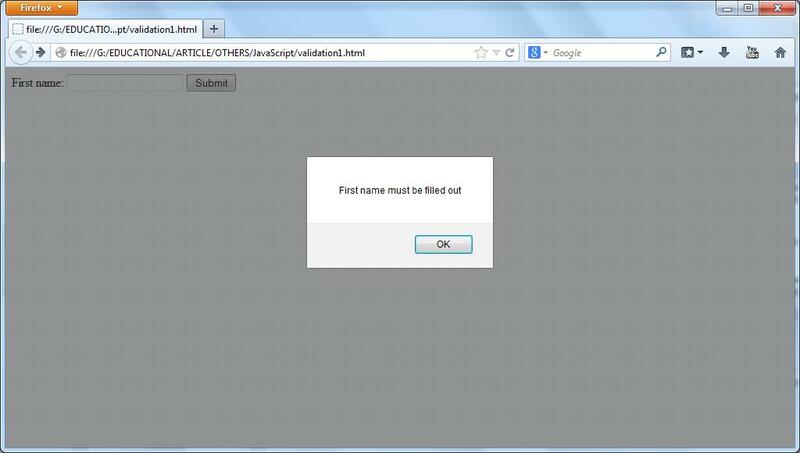 <form name = f1 onSubmit = "return validate()"
When we use the following code and give no arguments in the text box then this type of alert message will be displayed. 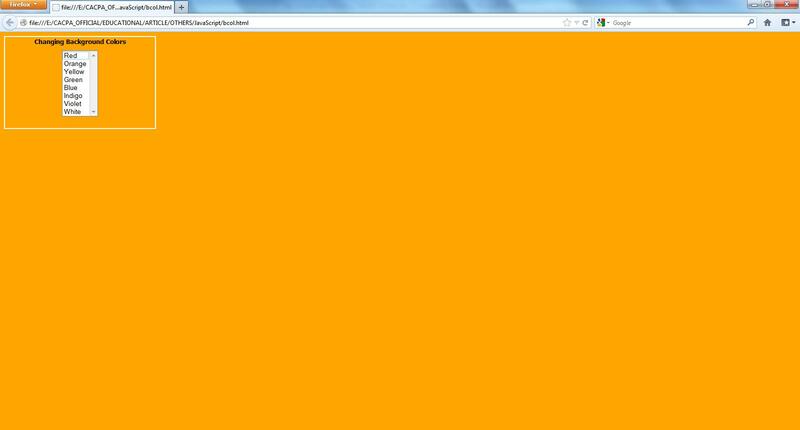 <option>yellow</option>         //This is option button that display as list box.